An interesting variety of green macro algae that's native to nutrient rich areas such as bird islands, lagoons and protected shallow waters. 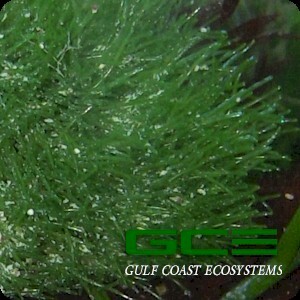 It features a bright green coloration with stiff, finely branched filaments that grow in small irregular shaped clumps. This species is very similar to chlorodesmis (maidens hair) and is often confused with chaetomorpha, but it's filaments are much more compact. You will receive several small clusters 3-4" in diameter.